After two days of OpenSocial hacking, here is my app, which fetches the users Recent tracks and displays it on the profile. Now since there is no way to directly fetch the last.fm username, I had to resort to asking the user. Also 1.0 although usable has a few errors which aren't handled smoothly. But they do not pose security risks. 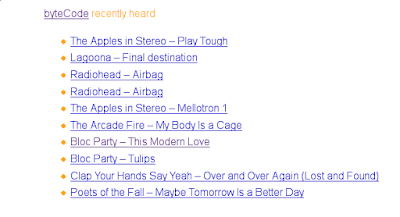 For now its in the sandbox, if you have access you can view it here Last.fm Recent Track and give me some feedback. It won't be on Orkut for a few days since there is a pretty large queue for applications waiting to be moderated. Oh yeah, here's the project page on Google Code.